A garden bench is one of the bigger accessories that get placed in gardens. A bench can provide a focal point for entertaining guests or provide a hidden retreat for people seeking solitude. When choosing a garden bench, it helps to think about three things in advance. How much use will your garden bench get? What materials and colors will fit your garden? How much space have you got in your chosen location? What sort of a budget do you have? These points will help you to decide upon wood versus metal, homemade versus manufactured, simple versus elaborate and so on. A stone bench can look great in the right setting but can look slightly ridiculous when not in harmony with the garden. Wooden benches rarely disappoint, but it is the responsibility of the buyer to ensure the wood comes from sustainable forestry. Amazonian teak is to be avoided since so much of the jungle is being decimated illegally. If you love your garden then don't fill it with the fruits of wanton destruction. 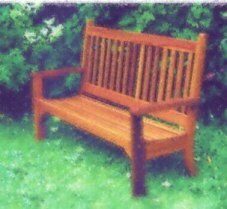 You can also consider making your own garden bench from a few logs or bricks or incorporate a bench into a garden wall. These bespoke designs often turn out to be the best options, allowing you to place a highly individual personal stamp on your garden. One tip is to use a smaller loal supplier who will deliver a bench on approval and who will set it up in your garden before taking payment. In this way you can ensure you have chosen the perfect garden bench and that it fits the environemt and your needs exactly, before you part with your money.